Many students mistakenly think that their academic skills may be enough for them to get into a great job, following graduation. But this is not true. The actual qualities which win them a position in the working world are the more intangible qualities. One such is decision making. 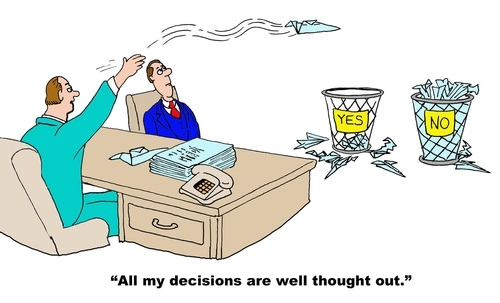 Decision making skills are very important in life as well as in the workplace. There will be situations where you need to make spot decisions on the basis of liimited information and with shortage of time. This may help in crisis situations as well in the strategic planning and organisational matters. People with effective decision making abilities are valued in any organisation.The question arises as to how young people can do that? Making great decisions depends on the timing. If the decision is made at the wrong time, it does not serve its purpose.A delay in making a decision at the appropriate time, may be costly for the person or the organisation. Hence, it is very important for students to recognise when is the best time to take decisions and do it at that time, rather than delaying. Timing matters. Rational thinking can sometimes be a more powerful decision-maker than a waste paper basket. Critical thinking is the foundation of effective decision making. For that, you must know what it is you are going to have to make decisions about. You need to identify the issue, dissect it in all its aspects and then make the decision based on understanding the pros and cons of it.This identification has to be the starting point, the groundwork for any vital decision to be made for e.g. a decision whether to take over a company or sell off its assets? Understanding one’s behaviour patterns as well as the behaviour patterns of others provide great insights into the biases which influences. Many times, our decision making capability is negatively affected by our views and perceptions towards and event including biases. Once you have sorted out your biases, you will be able to see the issue in its true state and then make a decision. This is the reason why people usually say not to make critical decisions when one is in an extrmeely emotional state. The resulting low objectivity can lead to poor decisions. Many times we take decisions purely from our point of view without thinking of the other people involved and the impact on them. For effective decision making, it is good where possible to know the positions of all involved. Also, try to visualise the possible benefits and consequences of the decision before taking a final call. The more you think through a particular situation or issue, the higher chances. So think through the alternatives, the options, conseuqences, everything and anything that would be influenced by this decision. It is important to go through all the possible risks incurred as a result of the decision making process. Following, practising and conscious implementation of these steps can enhance your decision making and help you shine in the working world.